Choosing your next car is based around many factors and trying to balance day to day needs and your weekend activities can be a compromise. At Perth Audi we believe life is for living and through our extensive range of "Lifestyle Options" we can cater for your day to day needs as well as the more exciting times in your life. Audi Beam LED Entry Lights replace the existing lights in the door and project a high quality beam of LED light on to the ground when the door is open. Comes as set of two for the left and right door. For vehicles with Interior Lighting Pack or door puddle lamps (pictured). Available with the four rings or the quattro logo. 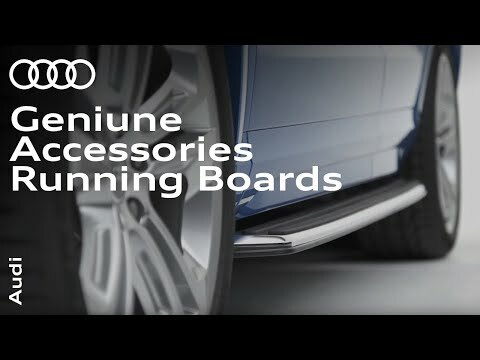 Available on all models in the Audi range our web exclusive offer price is only £89 fitted. A great value way to individualise your new Audi. Giving you extra confidence behind the wheel, the UTR system acts as a second pair of eyes, recording while you’re on the road and providing you with vital evidence should your vehicle get damaged. What’s more, you can get Audi’s innovative front and rear facing UTR system from just £649 inc VAT and fitting.